Совместный релиз Satanath Records и Sevared Records: новый альбом "Fatalistic Uprisal Of Abhorrent Creation" британской death/black metal группы Demonic Obedience выходит 17 апреля! / Co-release Satanath Records with Sevared Records: new album "Fatalistic Uprisal Of Abhorrent Creation" of UK death/black metal band Demonic Obedience is out on April 17th, 2018! Нечестивые ветры Ада поднялись ещё раз, чтобы извергнуть третий полноформатный альбом британской death/black metal группы Demonic Obedience из самых тёмных уголков нашего разума. Восемь композиций настоящего олдскульного Blackened Death Metal будут преследовать Вас и днём, и ночью. Бестиальный, хаотичный и мучительный "Fatalistic Uprisal Of Abhorrent Creation" пропитает Ваш голод тёмным, оккультным Death Metal. С демоническим вокалом от Kruxator, жестокими риффами от George Ntavelas и сокрушительными басовыми линиями от Mark Stormwhipper этот альбом доказывает, что дух старой школы Death Metal по-прежнему жив и настолько же силён, как и прежде. «Fatalistic Uprisal of Abhorrent Creation» был записан в Deception Studio (Эдинбург, Шотландия). Сведение от Achilleas из Achillman Studios (Греция). Артворк от PAINT-IT-BLACK. Для поклонников Immolation, Incantation и Dead Congregation. Demonic Obedience started in Greece (later Scotland, UK) as a one man band which rose from the ashes of Deceptive Incarnation. Founded by George Ntavelas and George Seremetis in early 2013 under the name of ''The Deepest'', the band's future was destined to change, in a short period of time, from progressive Death Metal into an old school Death/Black Metal Beast! On the 1st of August 2014, 'Morbid Supremacy of Evil', the first full-length album of the band. In the next months Ntavelas was working already on new material which meant to be the second full length album, called ‘’Nocturnal Hymns to the Fallen’’, a more brutal and dark record which was released by Satanath Records (Russia) and Sevared Records (USA). By the end of 2016, Kruxator (vocals) and Mark Stormwhipper (bass) joined the band and new tracks were composed and recorded for the third album of the band ‘Fatalistic Uprisal of Abhorrent Creation’, a bestial album straight from the depths of Hell. 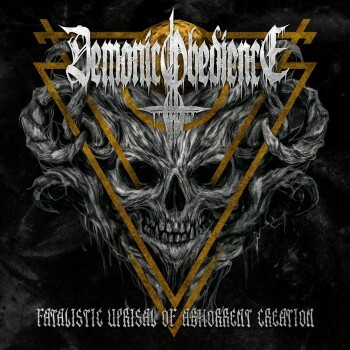 The Unholy winds of Hell raised for once more to bring the third full length album of UK death/black metal band Demonic Obedience from the darkest corners of our minds. 8 compositions of pure old school Blackened Death Metal will haunt your days and nights. Bestial, chaotic and torturing, ‘Fatalistic Uprisal of Abhorrent Creation’ will feed your hunger for dark, occult Death Metal. With Kruxator’s demonic vocals, George’s brutal riffs and Mark’s crushing bass lines, this album is coming to prove that the spirit of old school Death Metal still lives and is as powerful as ever. ‘Fatalistic Uprisal of Abhorrent Creation’ was recorded at Deception Studio, Edinburgh, Scotland and mixed and mastered by Achilleas at Achillman Studios, Greece. Artwork by PAINT-IT-BLACK. For fans of Immolation, Incantation and Dead Congregation.